Dr. Phillips was born and raised in Trinidad and Tobago – a small but beautiful island in the southern-most part of the Caribbean. She was the first of three girls and her parents still reside in Trinidad and Tobago. 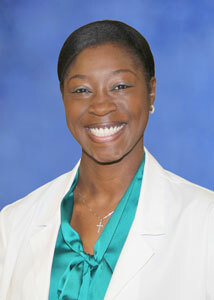 She is married to her long-time love – Dr. Charles Fotuchang – hospitalist in Internal Medicine at MMC. They have a 2 year old son – Jehu. She was introduced to Murphy and the surrounding communities four years ago by her husband, and she loves the serenity and beauty of what she now calls “her mountains”. Pushpa was educated in the Caribbean, but moved to Brooklyn, NY for clinical rotations during medical school and then to Staten Island, NY for her residency in Ob/Gyn. She enjoys organizing and performing community service, all sporting activities, traveling, leisure reading and entertaining.